We had 5 1/2 great years at our location in Time Plaza. Thanks to everyone for making the Southside Library such a success. 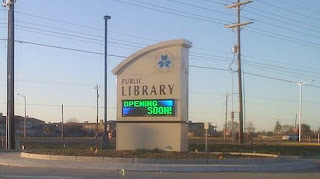 Reopening - GRAND OPENING: Tuesday, April 14th 10 a.m.
Our Grand Opening has been set for Tuesday, April 14th at 10:00 a.m. - during National Library Week. Staff is busy working inside - loading the shelves with books, DVDs, CDs and installing computers. Landscaping is in progress on the grounds. Please enjoy this slideshow preview.